I truly believe that we are all entitled to perfect health and wellness. I myself have battled through health issues that at some points, completely took me over. Both mental and physically. I, in a sense, feel your pain right now. I know that you may be coming to this article suffering in some way or another. I empathize with you. But I also know, in my heart of hearts, that you can heal your life completely and fully. That you and everyone on this earth have capabilities in us that are so ingrained in our DNA. These capabilities are there to help us completely restore our physical, mental and emotional health. This is one of the biggest reasons I have created this list. To help us affirm what we want in this life. A perfect body and mind. One that is free of limiting beliefs and toxic feelings. So we can live out our time on earth with vitality and youthful exuberance. Through the affirmations on healing below, we can start this process. The process of healing, the journey to perfect healthy. Which is a road that can get rocky. 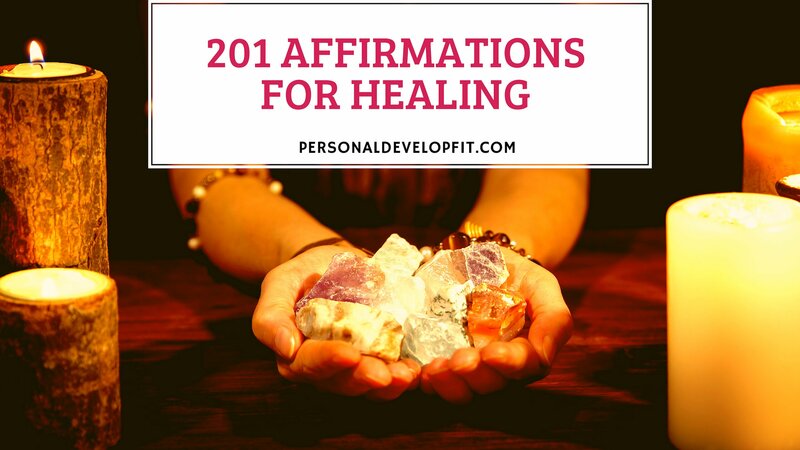 But with this list of positive affirmations, we can pave that road to health with brand new pavement. Smoothing out our ride and allowing us to arrive much faster and with less pain. Here is the list my friends. I hope it truly helps you in a massive way on your journey of healing. My body is perfectly healed in the here and now. Energy and vitality course through my veins. Healing is a major force in my life. I love the feeling of being entirely healed. I know that my body is becoming more healed each day. I resonate with the healing powers of the universe and am in complete alignment with their powers. I know that the universe wants me to be healed. Perfect health is by birthright. I envision my body being perfectly healed and healthy. My body communicates what it needs to me and I trust and adhere to it each and every time. I naturally make the right choices that support my healing. I love the feeling of youthful vitality and exuberance that flows through me. I am constantly feeling better and better. My healing rate is accelerated in my body. I know I deserve to live a healthy life. My body functions perfectly and harmoniously. My intuition instructs me on exactly what to do to get and remain perfectly health. I love feeling my body function at optimal levels. There is nothing I cannot do because I am in perfect health. There is the power of the universe inside me that wants to heal me right now. I allow the powers of the universe to bring entire mental and physical healing. My immune system functions in complete perfection. My cells are surrounded by the healing love of God. My physical, emotional and spiritual wounds are all healed and dissipated right now. My mind and body know how to heal itself, and is doing so with each minute of the day. I heal my body naturally and with ease. I am so happy about my perfect health. I have perfect health for my entire life. People compliment me on how vibrant and healthy and healed I look. I look forward to living my whole life since I am perfectly healed. I know that my healing capabilities are strong and I rest in that. I let go of trying to control my healing seeing as that I know it is already done. My healing is inspiring and uplifting to others. I am a teacher of healing since I am able to heal myself with such ease. I easily adhere to proper eating and exercise. I treat my body with respect and compassion because I know they are beneficial feelings for healing. I love the feeling of eating good foods and exercising my body in a way that supports my healing. I naturally bump in to people how give me effective tips on how to heal my mind and body. I let go of thoughts with ease that are getting in the way of my healing and health. Forgiveness is a big factor in my life as I know it helps with my healing. My family and friends are in complete support of my healing. I regenerate in a healing way with ease. My mind and body are in perfect harmony in support of my healing. My prayers are powerful and strong and bring about full healing in my life. I gravitate naturally to videos and books that tell me exactly how I need to heal my body. I use the power of love and bestow in on my body to accelerate my healing. My life is a matter of choices, and right this second, I choose to live a completely healed life. I can, I will, I must fight through anything to get me to the healing I deserve and desire. I know that everything happens for a reason and I learn and grow while pursing perfect health and healing. Healing energy is bestowed upon me by strangers, friends and family. All of the universe conspires to help me attain perfect health and I am thankful and grateful for that. What I have gone though does not define who I am or need to stay with me. It is not my story. My story is I am truly healed. I study that greatest minds about how to heal my body, and in turn their positive programs become mind and help be heal my life completely. My trials and tribulations are serving a higher purpose for my healing. My story of healing is impacting millions of people. I know the setback is never as great as the comeback. Healing is what I do most naturally. My mind is so powerful and full of healing thoughts at all times. I enjoy the feeling of leaving my trials behind and enjoying perfect health. I meet incredible people along my journey of healing. Where I am now doesn’t reflect my future health and healing. I put healing in the hands of God for I know He wants what is truly best for me. If one person has been healed, that shows that I can be to. Which inspires me to attain perfect health. Health and wellness are the most important thing to me. With my perfect health, I can do everything in my life so much better. I feel so alive right now and for the rest of my days. When I think about healing I feel as if I am already truly healed. I came into this world with a purpose and my perfect health is helping me fulfill this purpose. People notice my energy and vitality and compliment on how healthy I look and am wherever I go. Things feels so fun and easy because I feel so great and healthy. I look forward to helping others with their healing for I now know so much about healing and have done so completely with myself. I know nothing is impossible in this universe and rest in that knowing that miracles are happening with my health right now. I replace negative thoughts with positive and empowering thoughts that support my health and healing. Health and healing is one of my strongest innate abilities. I meditate on perfect health and healing daily. People are naturally attracted to my healing aura. I amaze even myself with how fast I can naturally heal myself. I stay true to all the best ways to achieve natural and perfect healing. I know doctors only know so much so therefore I don’t believe everything they say, only what my positive thoughts say about how I can and am attaining perfect healing and wellness. I am constantly moving on and away from my unhealthy past and moving into a completely healed present and future. I am passionate about my healing. I will never stop until I am perfectly healed. I never give up on my healing. Healing is something that comes to me with ease. I show myself everyday that I am perfectly healed and committed to perfect healing. Every time I think about my healing, I get empowering thoughts around it. My personal development goals are heavily based in goals around my healing. I naturally follow through with plans that I and my doctors have made to get me to perfect healing. My body functions perfectly and properly. My vision for healing far surpasses what I can even comprehend. I know miracles are coming into my life to heal me completely. I love how my mind and body communicate with each other to help with my healing. I choose to always be a fighter and fight my way to healing and restoration. I look at my health as a challenge that I can easily overcome and arrive at perfect healing. When I wake up each morning, I gravitate towards positive thoughts that help my healing and keep me in a good state of mind for the rest of the day. The foods and drinks and supplements I take for attaining perfect health taste and feel great in my body. My body feels even better than it did when I was in youth. Healing and restoration are my mantra, always and forever. I can’t help but smile knowing my body is being healed completely. I give thanks for what my disease has taught me, and am thankful that I am fully healed from it. I release out of my body feelings of pain and discomfort naturally and easily. I know the word “disease” is simply saying “dis ease” So I choose to be at a state of ease for all of my life. I am open to receiving all the healing the universe wants to bring to me. I am open to Western and Eastern medicine that can help my healing and wellness. Food is thy medicine, that is why I eat foods that only support my healing and nothing else. I don’t need to know the reasons why my health got off track, I only think about progressive ways to guarantee my healing. I look at life as a perfect journey leading me to perfect health. Getting me closer and closer each day. I use the power of laughter to heal and restore my body. I can’t help but know that I am blessed and highly favored by the universe which wants and is bringing me healing. I awe at my ability to heal my body naturally and with ease. I don’t listen to negative speech or media about disease and disorders, I only entertain positive things about healing and good health. I can barely contain my joy about being in perfect health. Disease is created in the mind, therefore I commit to only planting positive and nourishing thoughts that blossom in support to my perfect healing. I know by body is constantly regenerating, and with every regeneration I am bringing about perfect healing. I laugh in the face of adversity knowing that I am imploring the power of healing in my life each and every second of the day. My health and healing is blessed and highly favored. I choose to commit my life to healing and will do whatever it takes to bring it into my life. I let go of all fear and anxiety knowing that I am healed in the hear and now. I don’t attach any time frame to my healing because I know the universe can bring healing to he instantly. I my health and wellness is constantly progressing to higher and higher levels. My core being vibrates at the level that is perfectly conducive to healing. My perfect health and healing allows me to live the life I have always wanted and exactly how I want to live it. I attract financial opportunities along my healing journey that allows me to buy things that help me heal even faster. I am fascinated and in awe of how fast I heal. Not only is by body being healed completely but so are all my relationships, my finances and my spiritual healing is also taking place in full effect. I never choose to do anything that results in me feeling bad. I feel at ease with my existence on this earth as it is being maximized through living in true health and perfect wellness. I am physically and emotionally connected with perfect healing and restoration. My body is in a state of perfect and harmonious balance. My sleep brings me into deep state of relaxation that brings about fast healing to my body and mind. I engage in relaxing behaviors with ease, which allows my mind and body to rest into a state of healing and happiness. I know no limits to my healing as I know my creator has no limits in how rapid my healthy can be completely restored. I sit in a state of knowing and comfort about the rapid healing taking place in my life right now and always. My health is being brought to a stage of complete healing in the here and now. I silence my mind through deep meditation because I know a quiet mind works miracles for my health and wellness. I know that things only have as much power as I give it, that is why I give disease and disorder little or no power, and all my power to thoughts and feelings about my healing and restoration. I own my story of complete healing and am writing it each day in a way that supports a beautiful ending which results in me being completely restored to perfect health. I am who I hang out with, that is why I easily gravitate to people that are health and energetic, and hang out with them regularly. I put my faith in God to bring about entire full body restoration. My whole entire being is at ease knowing the universe is on my side and is working tirelessly to bring me healing. I am deeply connected with the abundant source of healing energy of the world. I feel powerful and youthful in my perfectly healed and healthy body. I look at my body with compassion and love, healing it with these two powerful forces. I see where and how I need to make my health perfect and do so with ease. I am passionate about health and wellness and use it daily for perfect and complete healing. I have a deep knowing that my body is and always will be completely healed. My healing abilities are always evident to me. Healing takes place in my body each and every day while I am asleep and awake. I use all my senses to soak in the pleasure of how truly healed I am. I easily correct bad habits that are keeping me from staying perfectly healed. I find pleasure knowing that I am doing everything in my power to restore my health. I bless the people I see who are in perfect health for I know what I give out must come back. Good health is in my DNA. My obligation to myself is to live this life congruent with acts and decisions that bring me to full and complete healing and restoration. I choose to commit my entire life to my healing. I know that the angels are on my side and are supporting me fully in the healing journey. I don’t entertain lack thoughts about health and healing, I know anything is truly possible. I am grateful for my entire body and give thanks for it’s healing and restoring abilities. I know God’s conscious flows through me and can and wants to heal me instantly. I accept where I am at which allows me to move forward toward healing more effectively. I do not resist the negative feelings in my body for I now that what we resist persists. My disease or disorder is dissipating and dissolving into nothing. I give my body full permission to enter and stay in a state of perfect health. I breathe in healing air and blow out all negativity and disease and toxicity. I bless the foods I eat for I know they are partnering with my healing abilities. I recognize all the things I love about myself readily, which helps put my energy in a positive state conducive to healing. I feel so blessed to have a protective layer of skin and perfectly working organs that detoxify me into a perfect state of health. I love my intestinal track and know it is working perfect to create a harmonious healing environment in my body. I am worth of living a life with perfect health. I do not let other peoples disease and disorders scare me, I see them and myself as being completely healed. I walk through this world with pure acceptance for where I am physically, knowing that the tides are changing in my favor. I learn the lesson that my discomfort is trying to teach me, therefore I can move on from it because I have learned from it. I love that I was taught a great lesson through my experience and love even more how I am perfectly healed from it. I can appreciate healing and health so much more because of what I have been through so it is not a waste of experience. I have never felt this great before in my entire life. I am so happy and healthy. My pain is dissolving more and more and replaced with perfect healing and optimal function. I know my healing powers are bigger than any affliction know to man. Even my dreams are full of visions of me in perfect health. My dreams bring me even new ways and ideas on how I can completely heal myself. I only focus on feeling good, even when my mind tries to take me elsewhere. I am grateful for all experiences in my body. I let go and let God heal me. I know healing takes time and is happening every day, this is why I do not get frustrated with the process. I take full responsibility for my health and healing giving me complete power to do my own healing. I do not take no for an answer on my journey to complete healing. It feels so good to healed. I am a choosen one, a person who the universe chooses to heal in order to inspire and help heal others. Though my own healing, I find myself and my life purpose. My mind is so clear and harmonious. My body loves me and I love my body. I am a perfect example of healing and health. It is perfectly natural to live in abundant health and I am doing so daily. I treat my body as a temple and only feed it with good things. I shower my body with healing energy at all times. Every person on this earth is in complete support with me reaching a full state of healing. I easily maintain my healing by eating healthy, meditating and working out. These things are natural occurrences in my daily existence. I achieve complete bliss and enlightenment because of my healing journey. I arrive at each day with hope and optimism for my complete healing. So there it is my friend. A list of positive affirmations for healing and health. Just know that you are not alone in this journey. Follow me, I help you get to the end of the journey as a brand new, transformed and metamorphosized you. A moth that became a beautiful butterfly. At a point when you may have thought the world was over, and buried. You were simply being planted for to grow into something you had never been before. Share your journey below and what affirmation resonated these most with your heart and soul.